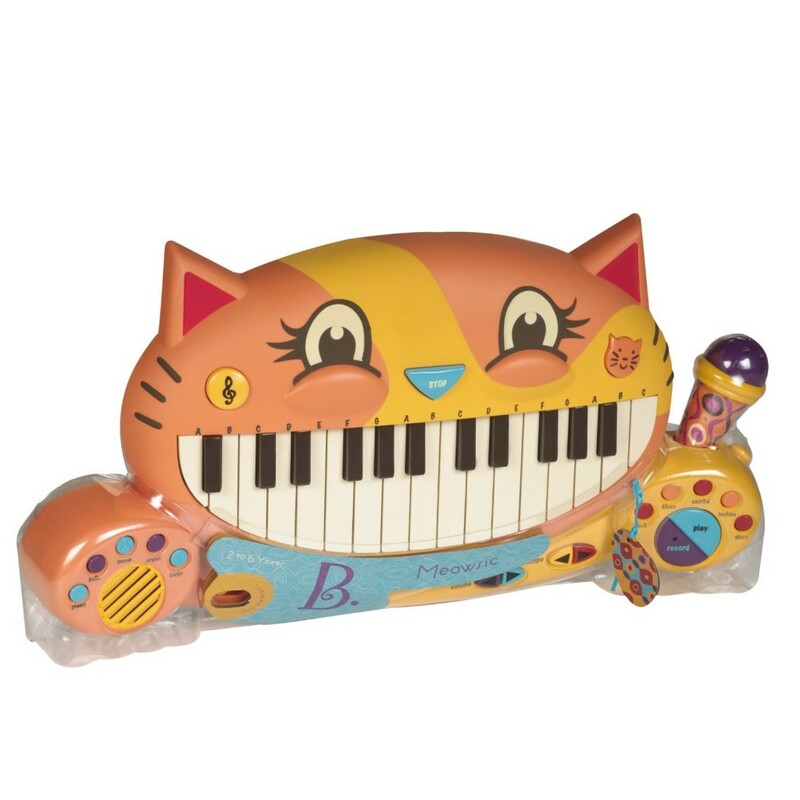 Amazing Toddler and Baby Pianos and Keyboards for Your Future Musician! Are you looking for the best pianos for toddlers? This page was created to help parents interested in starting their young children in music playing! Statistics have proven that children who start playing an instrument from a very young age, develop much better in school and in life! Music is good for their brains! On this webpage you will find the best and the cutest pianos and keyboards for toddlers and babies! A good toddler piano has to be very cute and colorful, to grab their attention, and it has to make ‘pretty’ sounds… Once your little one realizes he or she is able to ‘make’ pretty sounds with their very own fingers, they will get hooked! 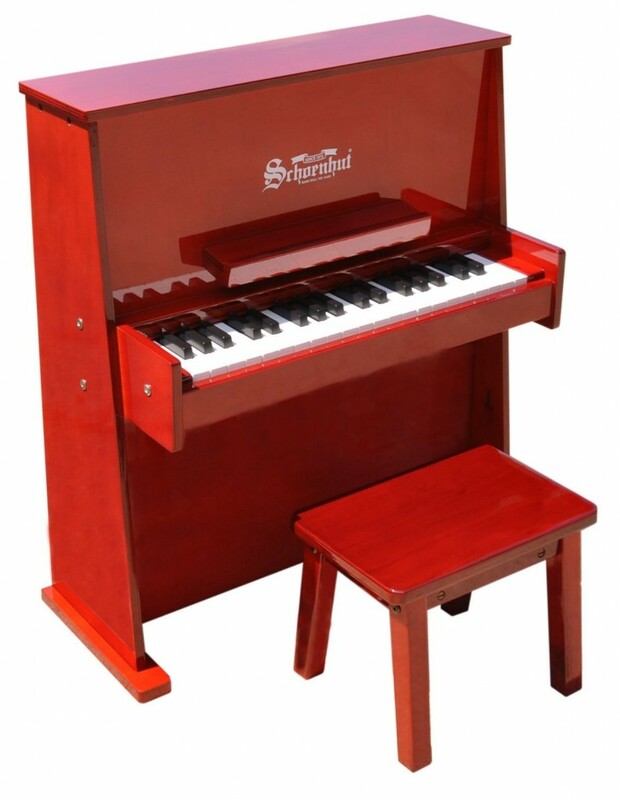 This cute red piano on the picture is a very good example of a good piano for your toddler! It is red, fun, cute and it has a cute puppy print too! Visuals are very important to children! That will be enough to spark their curiosity and make them want to ‘give it a try’! This cute toddler piano will be perfect for children ages 2 to 5 years old and after that they will be able to actually start playing a real piano! Give your children the gift of music this year! Very Cute Teddy Bear Toddler Piano! 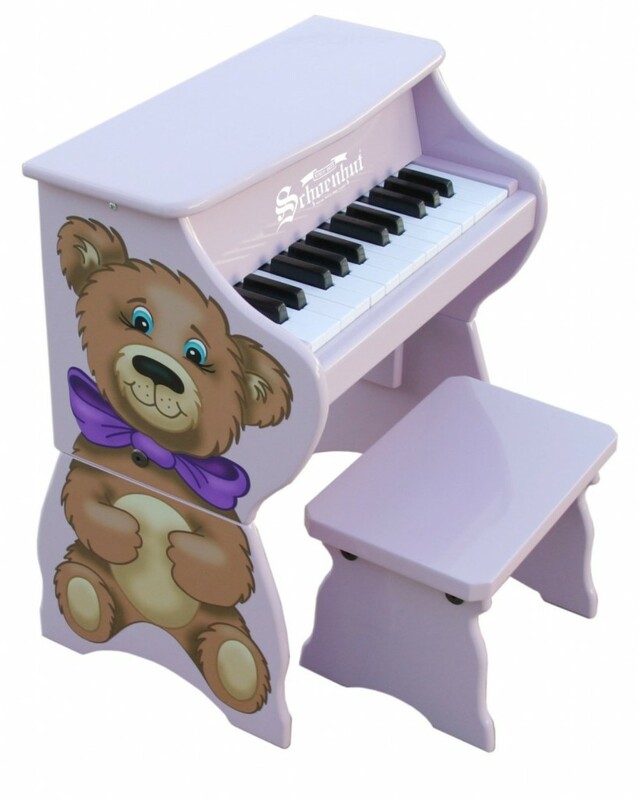 This cute toddler piano has a happy teddy bear print and a lovely lavender color! The height is perfect for a toddler and you can also have it on a table if you prefer. 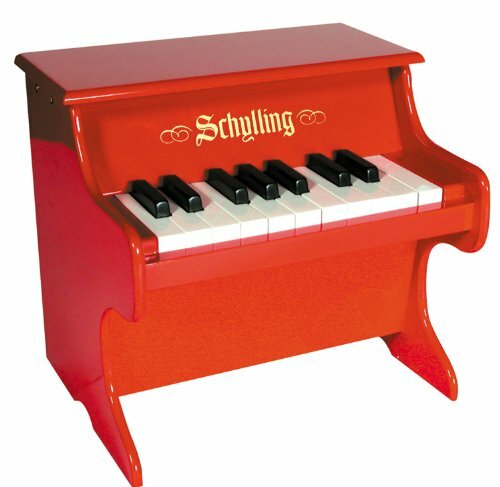 Schoenhut toy pianos are famous for their lovely chime-like tones which sound beautiful and magical! This cute teddy bear toddler piano will make an awesome Christmas gift idea! 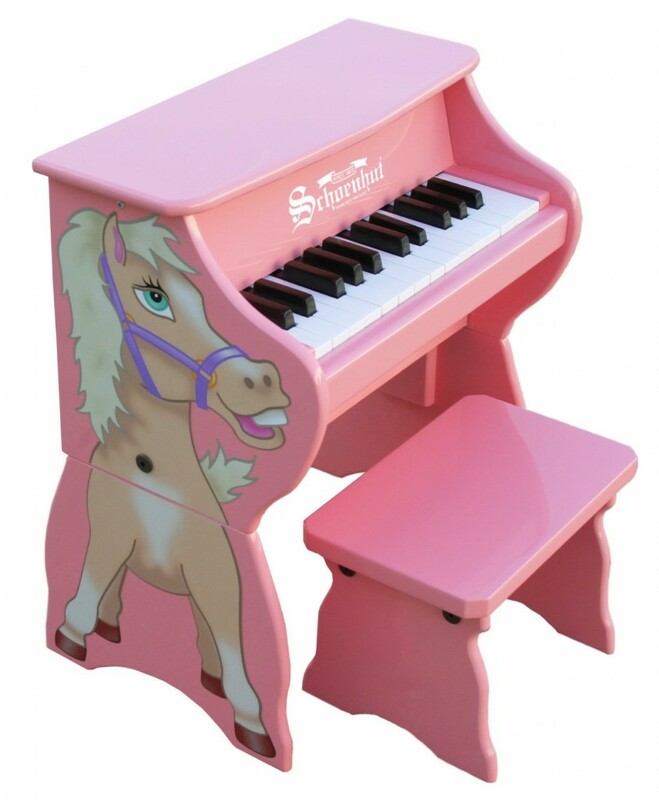 Adorable Pink Toddler Piano with Horse Print! 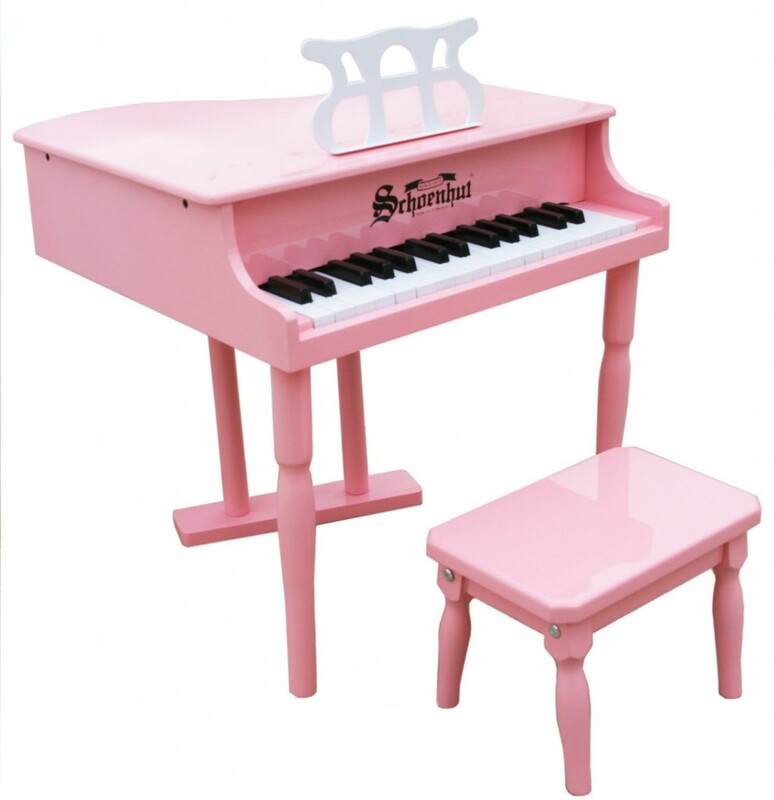 This cute pink toddler piano will be perfect for your little girl! It is adorable! Little girls love horses and this cute horse print will be enough to grab her attention! 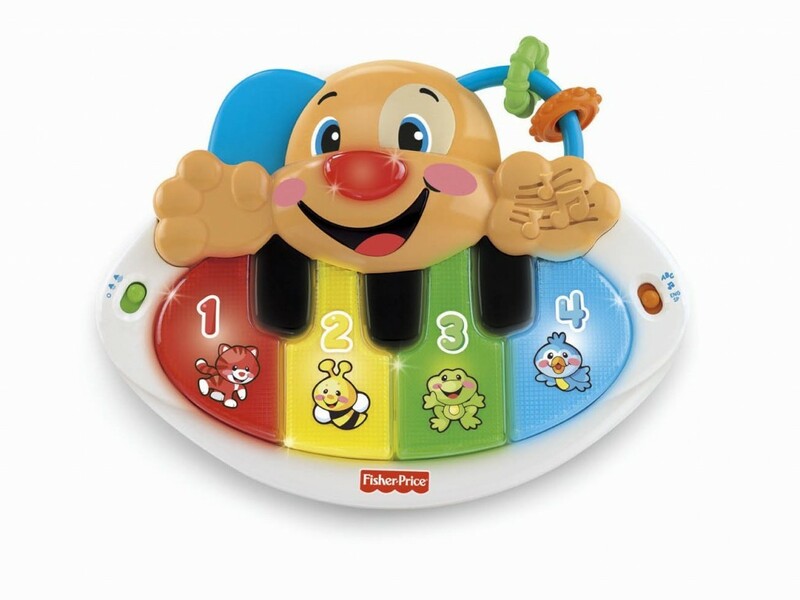 It also comes with a fun learning system especially created for toddlers, in which a removable color-coordinated strip fits behind the keys and guide their small fingers into playing the right notes and chords! It is easy enough for parents and grandparents without music training to be able to teach their kids! Needless to say this lovely pink toy piano will be perfect for a little girl’s bedroom! 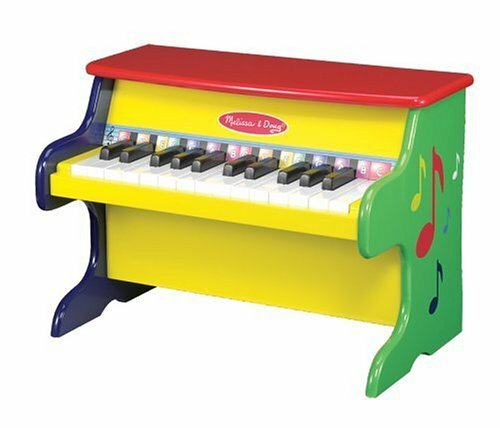 This fun and colorful piano for toddler is the most popular toddler piano in the market! Parents and grandparents absolutely love buying this fun piano for their kids because the price is great and the size is perfect even for kids around one year old! It is durable enough to pass to their siblings when they get older and it looks lovely in a child’s bedroom! 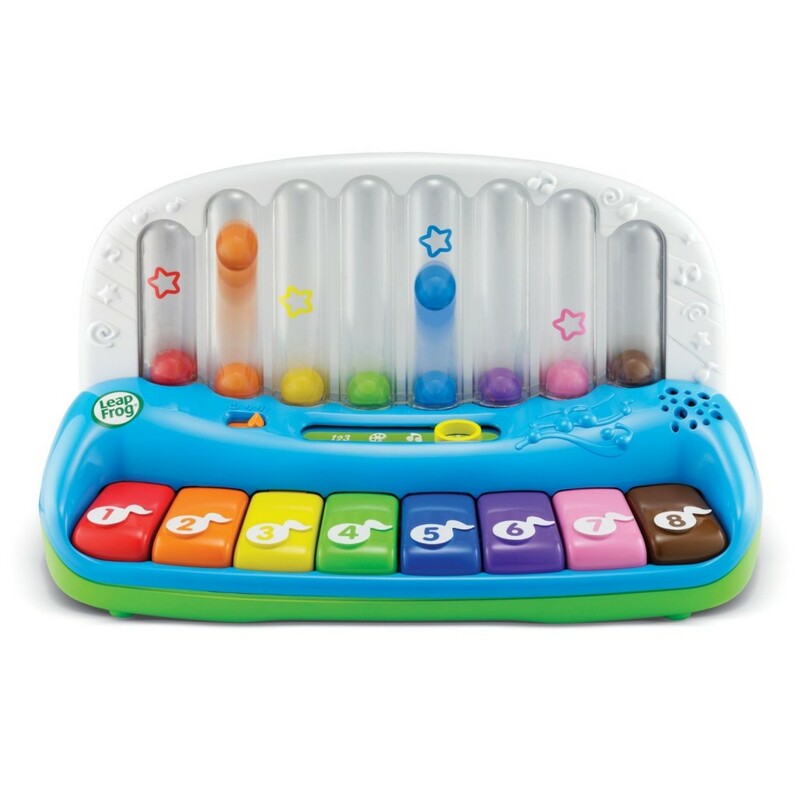 It has twenty-five color-coded keys to help your little ones learn how to play correctly! Enjoy! Cute Wooden Pianos for Toddlers! How cute, fun and adorable is this wooden piano for toddlers? With this cute piano for toddlers parents and grandparents will be able to teach their toddlers how to play simple tunes and have lots of fun in the process as well! Another extremely cute wooden piano for toddler! It is a fun mini-red piano! It is made of solid wood and it has 18 keys. Happy buyers say it is a great toddler piano, even for 1 year olds! Cutest Piano for Toddlers Ages 9 Months Old Until 3! This cute, fun and colorful Fisher Price interactive baby grand piano is one of the most bought pianos for babies and toddlers by parents! It is really educational for the little ones, teaching them numbers, colors, music styles and singing! It also has light-up keys and it makes the coolest electronic sounds! It is the perfect first piano for your baby! Check out how cute this Fisher Price baby grand piano is! Perfect Christmas gift idea for your baby! Cute keyboards for toddlers are excellent gift options on any occasion!Toddlers love playing musical toys and if you stimulate them from a very early age, they will develop better in school! Music is that important for kids! Toddler keyboards are usually very cute and colorful, of course, since visuals are very important to small kids, and they also make a variety of fun sounds! How cute and adorable is this kitty cat shape keyboard with a microphone? It comes with 20 fun songs and 7 kitty tunes! One of the best and most fun musical toys for toddlers! This cute pink keyboard for little girls is absolutely adorable! Look at this future girl musician! It also comes with a microphone, karaoke and speakers for a full musical experience! Besides piano sounds this cute keyboard will also make fun animal sounds and drum sounds, among other musical instruments! This pink keyboard will also look amazing in your little girl’s bedroom! 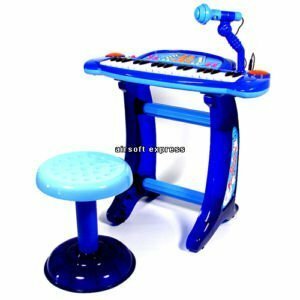 Cute Electric Piano for Kids! 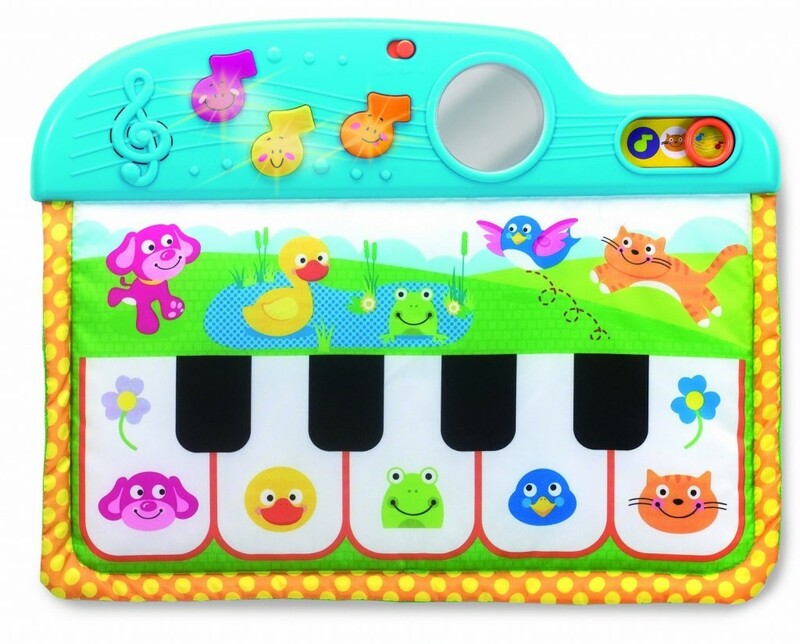 Another cute, colorful and fun electric keyboard for toddlers and small kids! This one can be for a little boy! It comes complete, with a microphone, speakers and even a stool! Will keep your little one musically entertained for hours! Best Toy Keyboard for Kids! 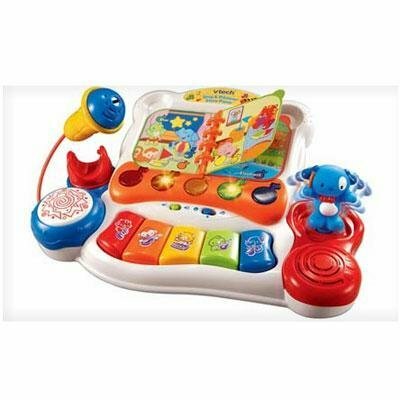 It plays over 10 different instruments, it has lots and lots of sound effects, it can record songs, the keys will light up too, which is very helpful for smaller kids, it comes with a cool songbook and 20 songs, it is also a sound mixer, which kids absolutely love! 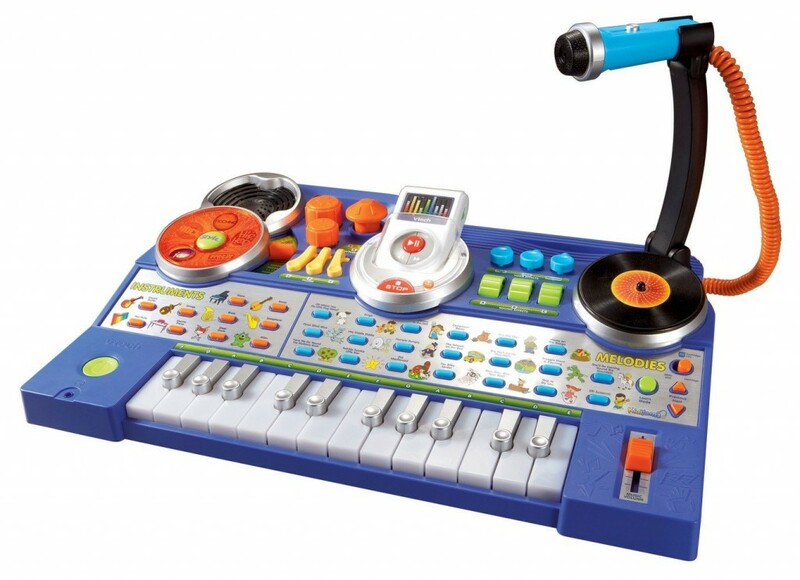 Needless to say this cool keyboard/mixer/jam studio for kids will make an awesome gift!! Fun Electronic Keyboard for Children! Another fun and very cool keyboard set for kids! I love the cool red color! Don’t you wish they made cool keyboards like that for grown-ups too? It has 37 keys that will also light up, it has a cool DJ scratch pad that boys love it! Happy buyers say this child keyboard is a huge success and it’s perfect for kids ages 2 to 7 years old! They also say it takes less than 5 minutes to set it up and the microphone works pretty well! 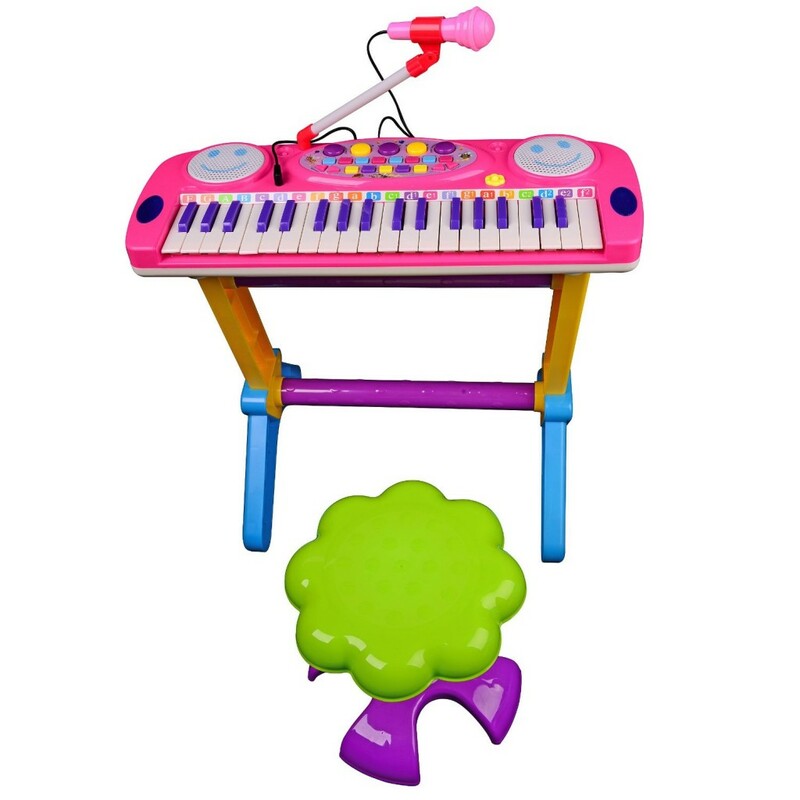 Cute Pink Toy Piano Keyboard with Microphone for Toddler Girls! This is a cute and fun 37 keys pink piano keyboard piano for kids ages 2 and 3 and up!! How adorable and cute is that? Needless to say kids go absolutely crazy with this fun keyboard with microphone! How cute is the tree shape bench? 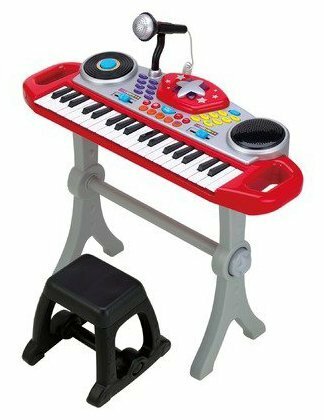 Fun Electronic Keyboard Set for 2 Year Olds! 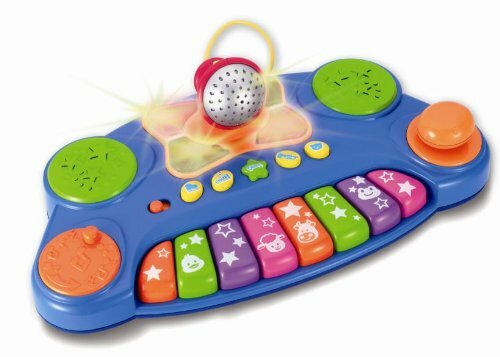 If you are looking for a fun and cute keyboard for your 2 year old little boy then I think you are going to like this fun toy keyboard set with flashing lights, fun built in demo songs and 5 different instrument sounds and rhythm! Parents said it is absolutely adorable! Best Toy Pianos for Babies! So you are here today looking for the best pianos for babies? Giving your baby his or her very first piano is a very good idea! Music is a wonderful way to help children improve their intelligence! Studies have proved that having children learn how to play music from an early age makes them smarter! Learning how to play an instrument greatly improves the brain! Kids get sharper and learn math and other subjects way faster than other kids who don’t play music. So you are definitely making the right decision here today! 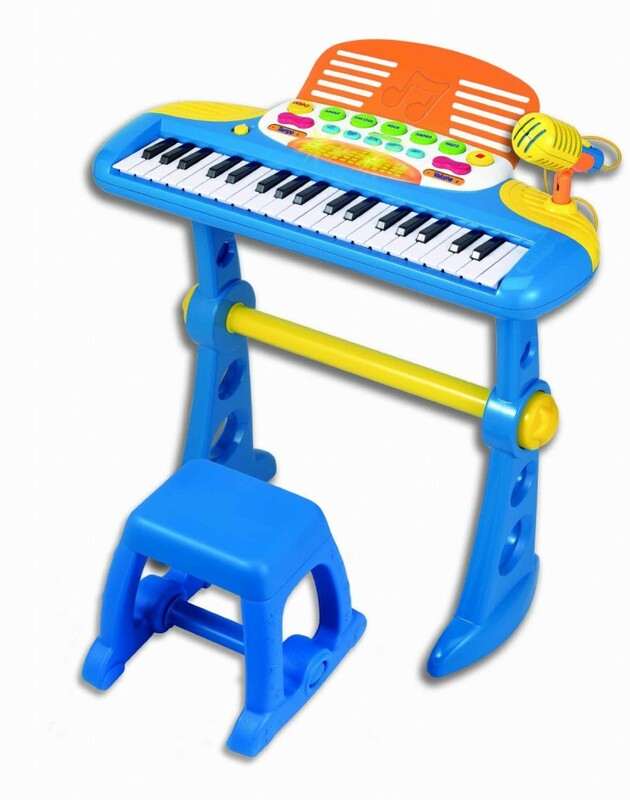 Let’s find a cute toy piano for your your child today! This is a very cute, fun and colorful piano for babies! First of all, babies are very attracted to sounds, colors and lights! They also LOVE pressing buttons, of course! They are natural ‘explorers’, ready to take on the world! He is soon going to find out that if he presses a button, he hears beautiful music or he makes fun sounds! Have the camera ready, because his surprised reaction will be priceless! 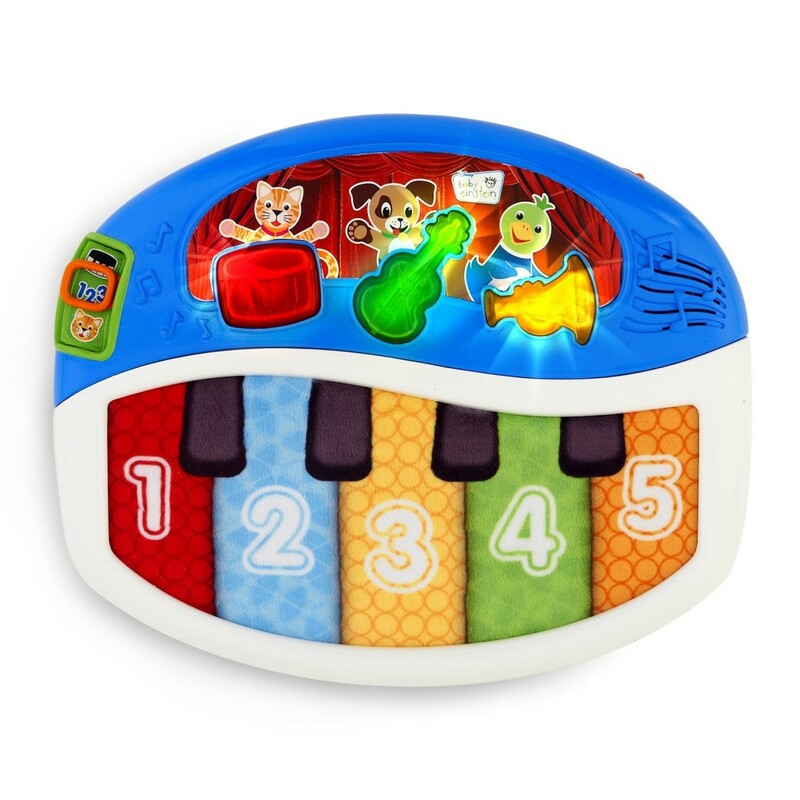 This cute Baby Einstein piano plays more than 20 classical melodies and fun sounds! When the number keys are pressed he can hear the numbers in three languages: English, Spanish and animal sounds! Parents say it is the perfect toy piano for a 6 month old baby and beyond! 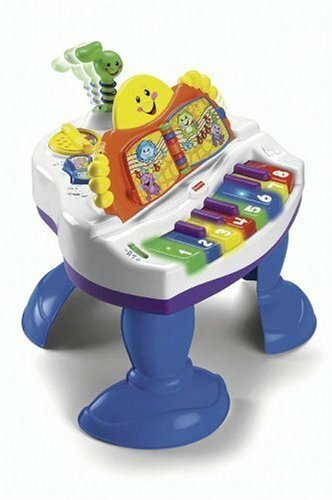 LeapFrog Fun Poppin’ Play Piano for Babies! Just by looking at this picture we can imagine how fun this cute and colorful toy piano will be! There are 8 fun and colorful musical keys and guess what will happen when your child presses them? The corresponding colorful ball will pop up! It also plays different songs and sounds, of course, to keep your little musician entertained for a long time! In ‘song’ mode, the toy piano will play a song and your child can play along, by pressing the piano keys. In ‘free play’ mode, your baby will be delighted to find out that each different key will make a different instrument sound! When in ‘color mode’, each colorful piano key will sing its color name! And in ‘number mode’ each key will sing its number! The Cutest Pianos for Babies! What a cute ‘puppy’ piano for babies 6 months old and up! First of all, if it’s Fisher-Price, you know it’s gonna be good! There are 4 light-up keys and three play modes. This cute puppy piano will also teach your little one some words in English and Spanish! It also plays 12 fun songs and the keys are so easy to press that some parents said that even their 4 month old baby could do it! This DJ music mixer toy piano also looks like it’s a blast! Can you imagine your baby, a DJ? There’s even a microphone for them to do all that cute ‘baby talk’ loud! There are also some fun ‘demo’ songs and 3 different instrument sounds, besides other fun ‘DJ’ stuff, such as the scratch pad and cool sound effects too! Guess what happens when baby turns one of the ‘book’ pages? Besides hearing a ‘magical’ sound, all the piano keys will change their sounds and will relate to what’s on the page! Babies will learn how to tell a story using music! There’s also a fun ‘learning mode’ in which they will learn some new words, sounds, animal names, shapes, colors and cool songs! There’s also a cool microphone too that kids love! Well, I love musical toys and these are all awesome choices for your little one! Cute Crib Piano for Babies as Young as 3 Months Old! Can you imagine your little musician saying later on that he started playing the piano from the crib? Well, it’s all possible now! Babies as young as 3 months old can start their music career! This is a very cute toy piano that can be used inside the crib or on the floor. It is made of polyester and it has cool flashing lights! Mummies love that it is made of cloth, so they don’t have to worry that baby will get hurt, and they also say that it keeps them happy and ‘busy’ in the crib for a long time! Younger babies soon learn that they can use their feet to kick on the right spot and make the fun sounds! CUTE PINK PIANOS FOR GIRLS! This very pink are of this webpage was created especially for YOUR little girl! 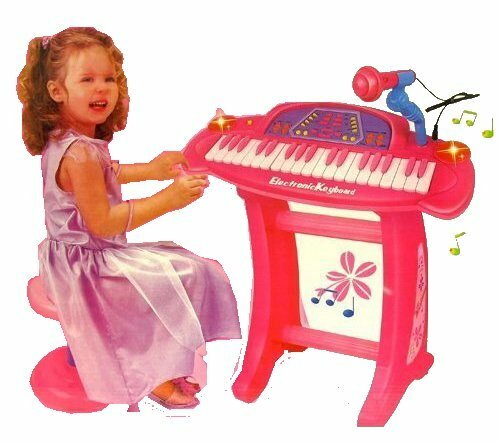 Here you are going to find the cutest pink piano for her! Why buy a pink piano? Because most little girls love the color pink already! I selected a few of the best quality and very cute pink pianos for toddler girls being sold right now! They are all very affordable and will look very cute in her pink bedroom! 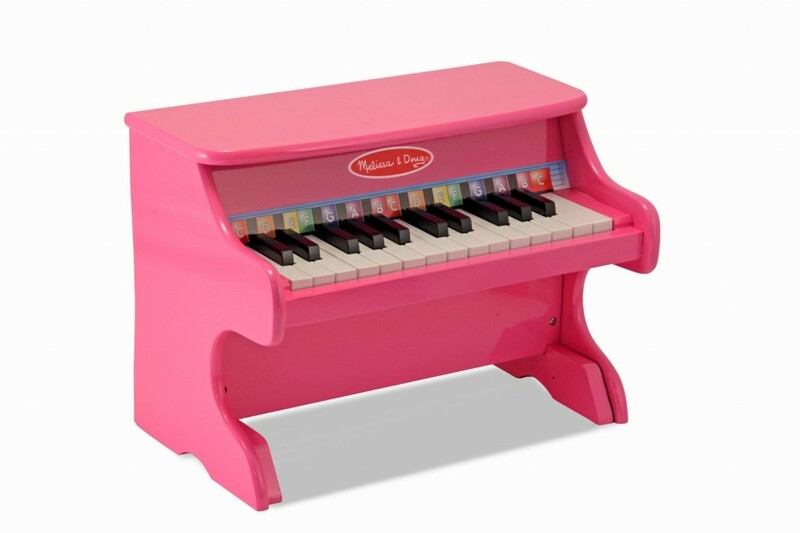 This cute Melissa and Doug pink piano with 25 keys is perfect for a 2, 3 and 4 year old little girl! 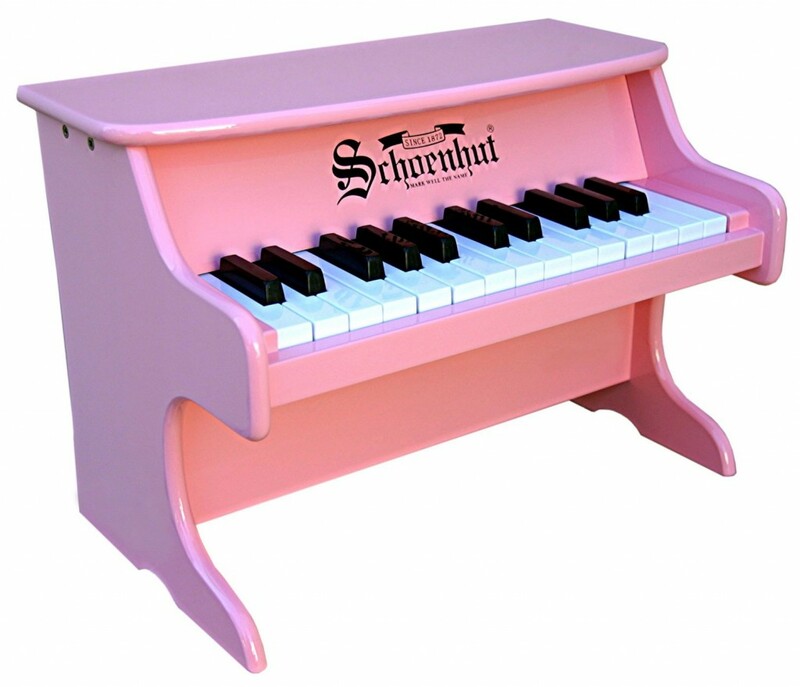 Adorable Baby Pink Piano for Toddler Girls! If you see your toddler girl already trying to play on your acoustic piano or in any other piano for that matter, don’t wait! Buy her a toy piano! This Schoenhut cute pink toy piano has 25 keys, it’s very sturdy, great-quality and it’s perfect for little girls as young as 12 and 13 months old to start playing! The minute they hit that first key and hear a lovely sound coming out, they will be hooked! If you are looking for a pink piano that really looks like and adult piano for your little girl, you are going to love this classic pink baby grand piano! Happy buyers said it’s absolutely perfect for a two year old girl who loves to play music! It looks even nicer than the picture and it’s very easy to assemble! Grandparents also said it is a great musical gift for their grandchildren! Pink Electric Grand Piano for Girls! 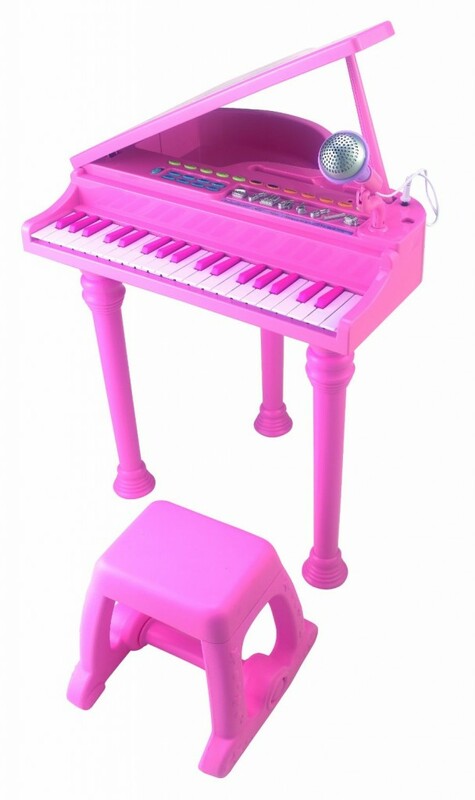 Another super cute and very pink toy grand piano for little girls! It is also a keyboard with 37 keys and microphone! 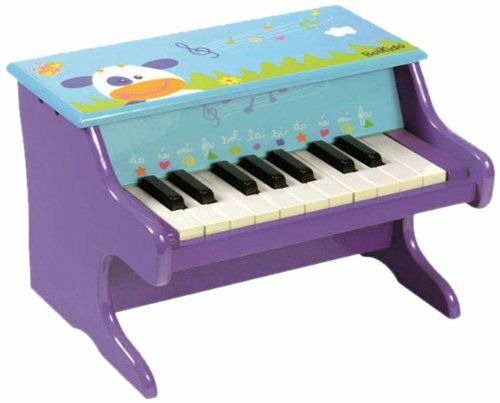 Great toy piano for toddler girls ages 3 to 5 years old! Perfect for your future American Idol to practice singing and playing music at the same time! 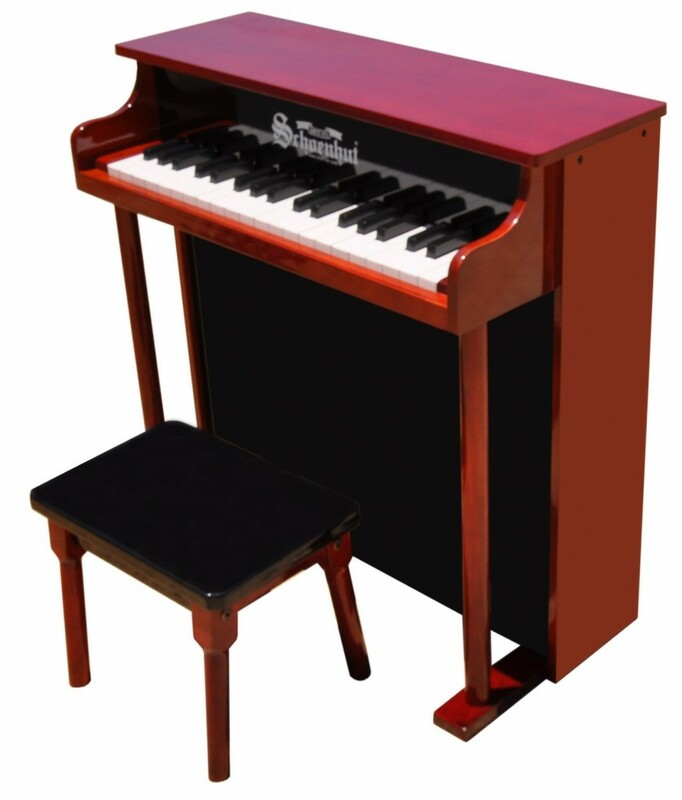 Schoenhut makes the best and most efficient pianos for toddlers on the market! 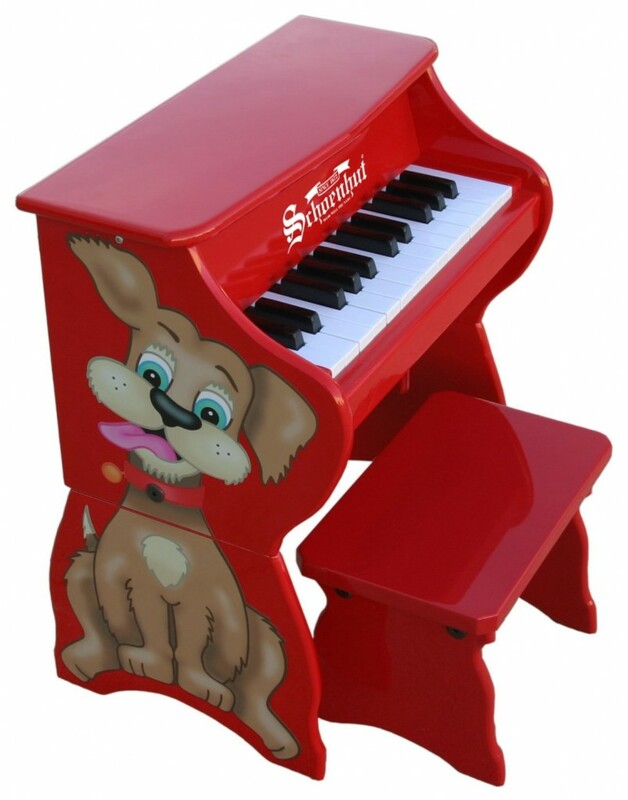 All Schoenhut children pianos are designed to keep a toddler’s interest in playing music! From the right size to right color and just the right “pretty sound”, you can’t go wrong by getting a fun, colorful and very cute Schoenhut piano for your toddler! Don’t get fooled by the name Schoenhut ‘toy piano’! Even though it may look like a toy, this beautiful toddler piano might be the very first step into your child’s brilliant music career! One of the best gifts we can ever give a child is the gift of music! 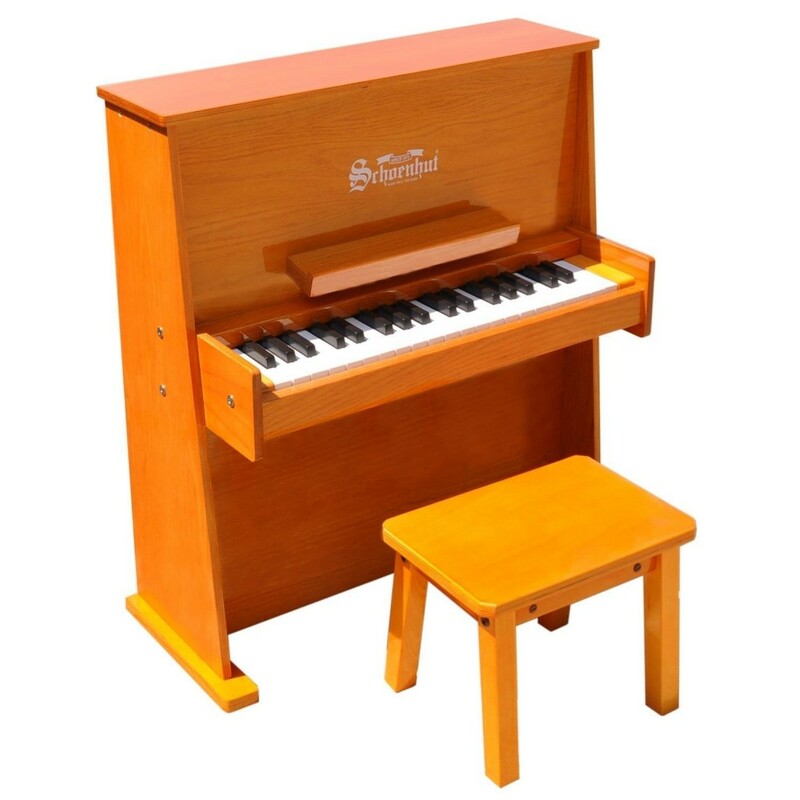 This gorgeous Schoenhut piano for toddler has a beautiful color and it’s made of solid maple and 1.5″ irch plywood. It is very durable, will lok amazing in your toddler’s bedroom, but most importantly, it plays beautiful chime-like notes, especially created for a toddler’s ears! Once their small fingers touch the first keys and they realize they can ‘make beautiful sounds’ with their hands, they will be hooked! This cute piano will be perfect for toddlers and children up to 5 years old! Enjoy! 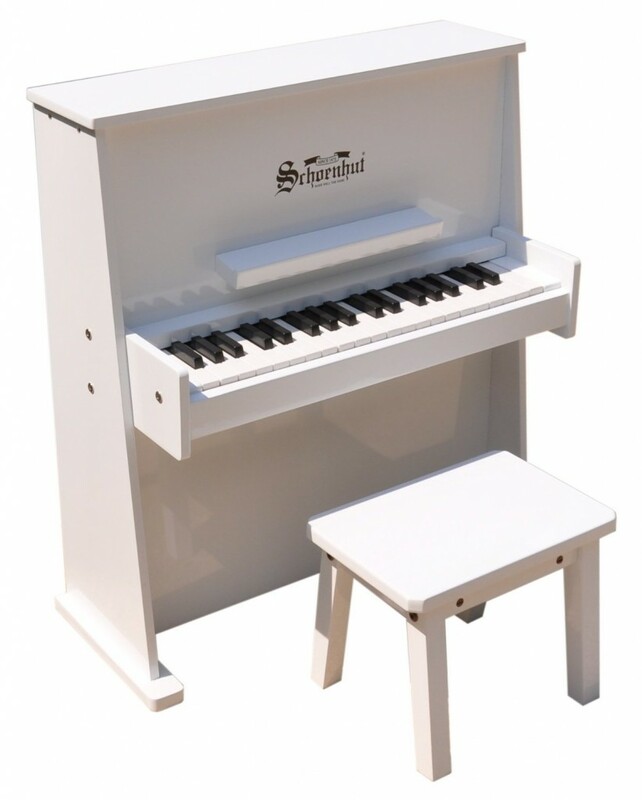 Beautiful White Piano for Kids! Parents love this Schoenhut white piano because it looks great in their children’s bedroom! Kids love this toy piano because it’s fun to play! All Schoenhut pianos come with a fun ‘play by color’ method, to help toddlers and small children understand how to use their small fingers on the keyboard! It is easy enough for any parent to teach them how to do it. 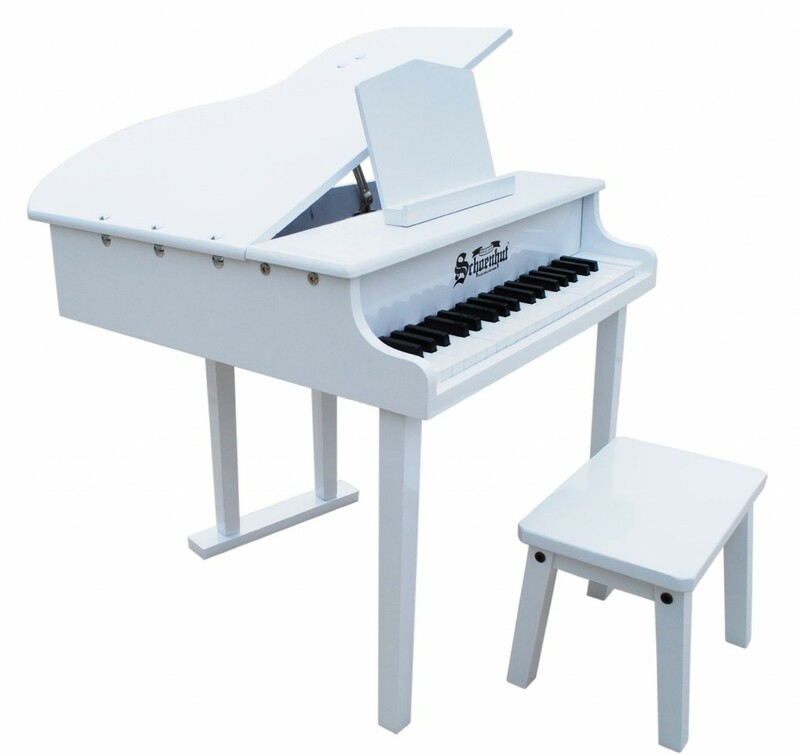 This beautiful white toddler piano is perfect for either a boy or girl’s bedroom! 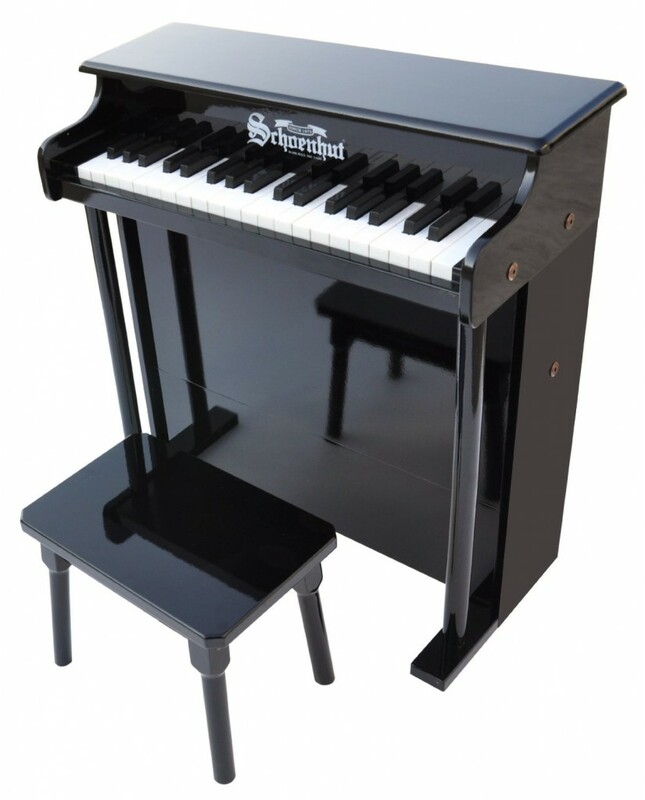 This gorgeous Schoenhut black upright piano for toddlers will look great anywhere in the house! It can even be put next to mommy’s real piano! (In fact, that would be a great idea to get your child even more eager to play!) Parents say they love how sturdy and well built this toy piano is and it’s perfect for kids ages 2 to 5 years old! 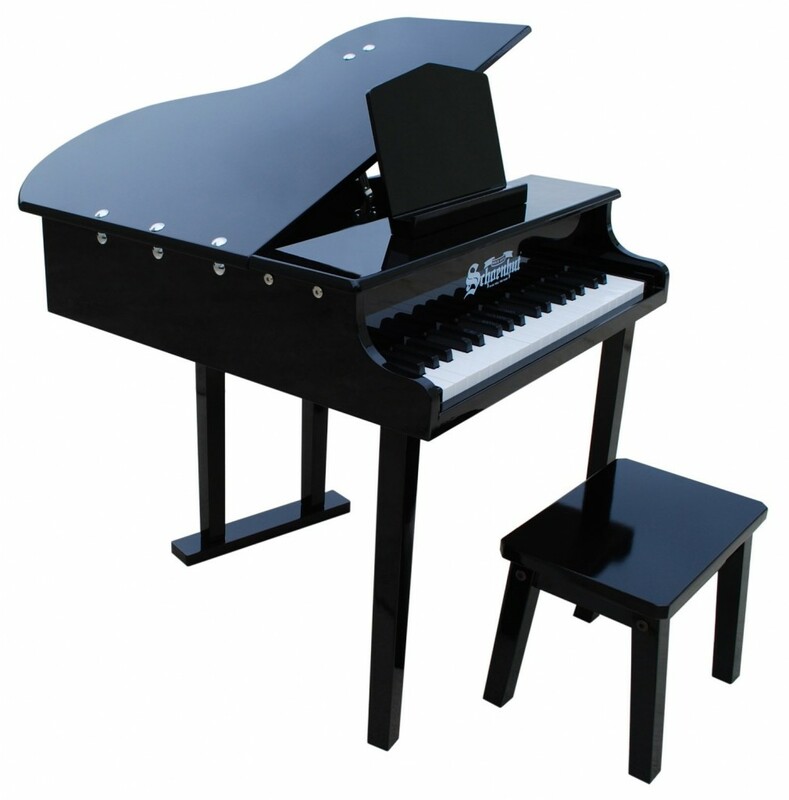 How about this gorgeous mini baby grand piano for toddler? Isn’t it amazing? It looks just like a real full-size concert grand-piano! It also makes the same chime-like notes the other Schoenhut pianos make. Even though parents may think the notes sound too much like a toy, for toddlers and kids it sounds ‘magical’! Perfect for kids 2 years old and up! This Schoenhut piano for toddler looks just like a real adult piano and it comes with a very easy learning system that even parents or grandparents can use to teach their toddlers! Happy buyers say it is absolutely beautiful and can be passed down to future generations! 37 Key White Concert Grand Piano for Toddlers! Gorgeous Schoenhut white concert baby grand piano for toddler! I love white pianos and this white baby grand for toddlers is very beautiful! The greatest thing about this toddler baby grand piano is that it is big enough to be with your child for many years! Teaching a toddler how to play the piano will give him a huge advantage later on!